This was to be our longest leg of the year – about 2000 nautical miles in all. Cornell’s book suggests that after leaving the calms around the Galapagos it should be a beam reach in the SE Trades almost all the way to Easter Island. He suggests avoiding an area outlined by 3° S and 8°S and 90°W and 95W° where calms and gale-condition squalls have often been reported. In theory, when you leave the Galapagos you should have SW winds that will allow you to sail south or almost so until you pick up the trades around 3°S. We had south winds and had to choose whether to go SW or SE and the latter was the direction we were trying to go anyway. The result was that we went right through the area mentioned above and had the nicest weather of the passage- go figure. If the passage from Ecuador to the Galapagos had been uneventful, this one was anything but. At first we had no winds to speak of and had to combine some motoring (15 hours or so) with a lot of ghosting along and picking up bits of wind from nearby squalls. For those familiar with it, it was very much like Lake Ontario racing in July. Squalls were constant and we probably went through 40+ on this trip. Some were welcome because they brought wind; many were not since they only increased the wind from 25 knots to 35 or so. Once we reached about 6°S we finally found the trades but also a frontal trough that gave us far too much wind for a day or so. The trades seemed to be mainly SSE rather than SE (let alone south) and the difference really matters. We had a great deal of water over the deck for days on end and even took two waves into the cockpit. We found leaks in Ainia that we had never seen and had a bit of damage to sails and rigging. The result is that we will be a true sloop until Tahiti where there is a rigger – not that we ever used our inner stay and staysail. We sailed this leg in radio contact with four other boats: Silas Crosby and Curare from British Columbia, Pyewacket II from Australia, and Bobby from California. Of these, the only one we actually saw was Silas Crosby, Our paths crossed about five days out from the Galapagos. Pyewacket was at Easter Island when we arrived and we will likely see much more of them since they are going to the same places as we are. Much excitement was added to the trip because Bobby , a 40 year old 34’ Taiwanese ketch, crewed by a 25 year old woman ,was having some serious problems. It has wooden masts and the top of the mainmast broke between the main and mizzen sheaves. The result was that the upper part of her main and mizzen were not supported – in fact, she could have lost the entire rig except that a lower forestay kept the main up. There were long SSB discussions about how best to secure the rig and then to jury-rig some sails so Bobby could make Easter Island (this all happened about 600 miles from the island and this is a very lonely part of the world – and it was blowing 25 knots most of the time from a direction that did not allow her to lay the island. She was combining sailing and some motoring (to get east) and we were heading for a rendezvous with her when two things happened. She had a broken coupling between her transmission and drive shaft. Running the engine with this out of alignment meant that she was taking on quite a bit of water. Scratch the motoring part and her need for fuel. As we were running toward her position we ran into a problem with a jib getting caught in the furler extrusion half-way up. The result was that the top half of the sail was acting as a jib and the bottom half as a spinnaker. We jury-rigged this to control the loose part and turned tail toward Easter since Emily no longer needed the fuel. 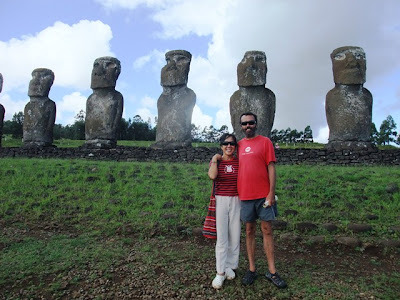 As I write this, Emily and Bobby are about 250 miles from Easter Island. The wind has switched to the east and even NE but it has also dropped substantially so she is only making 1 to 2 knots with a combination of a small jib, triple-reefed main (her damaged rigging does not allow her to raise more), and even a mizzen staysail. It does not look like we will be here when she arrives but she deserves a lot of credit for not giving up and finding solutions to the many problems she has faced. The Chilean Navy people here are waiting for her arrival and will tow Bobby into the very little, very sketchy harbour at Hanga Piko for repairs. It sounds like most of what she needs can be found on the island (repairs rather than new parts) so here trip is likely to continue at some point. (There is an Australian boat here that has been making repairs for five months and Jim on that boat will help Emily get going on her repairs. BTW, the Chilean Navy, like many navies and coast guards around the world will respond to an emergency and take a person off a boat but they will not tow the boat – so one is left with a very difficult choice. 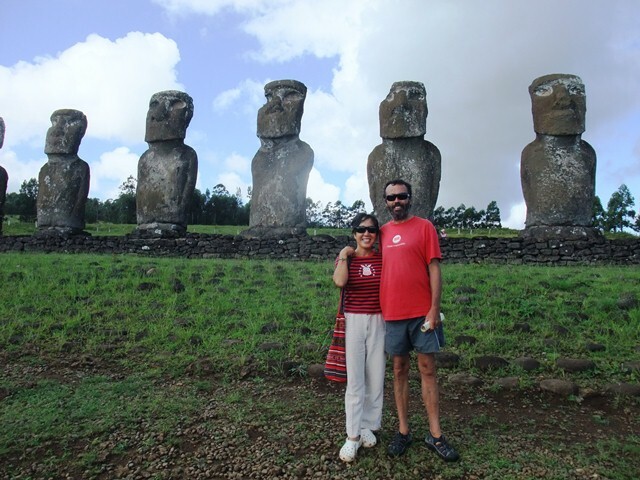 We arrived at Easter Island after 15 days and started our repairs and the drying out of the boat. The island is quite pretty and interesting but the anchorage is not very good at all. There are only a few areas of sand and the water is quite deep (we are anchored in 45 feet) and swells come around the island in both directions so it is very rolly. When we go ashore in the dinghy we have to go between two sets of breaking waves that are so close together that you actually can say hello to the kids surfing. Some days you cannot get ashore at all here as the waves break right across the entrance to the dinghy dock. Something like 80 boats a year visit Easter Island and it is quite busy now as there are five here (two Canadian, two Australian, and one French). 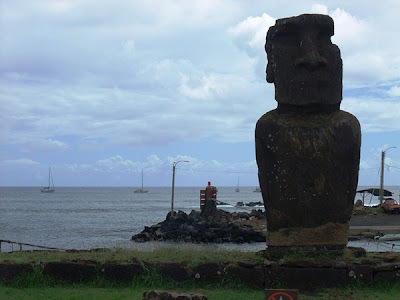 Most of Easter Island is like this with surf crashing on the shore. There are only a couple of decent-sized bays on this quite large island. 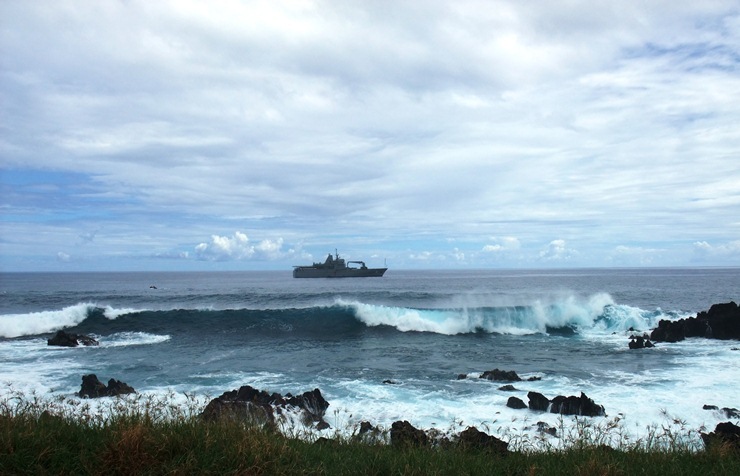 The ship is a Chilean navy vessel that brings freight to the island. Lighters go out to the ship to bring cargo ashore one container at a time. We did a tour of the island and the statues are quite remarkable. There are fewer than I thought – about 40 or so have been restored (all had been pushed over during various times of tribal conflict) with many more lying on the rocks, often broken at the neck. It is incredible to drive from the quarry where the statues were carved to the sites where they were displayed. One weighs 80 tons and was moved over a sizable hill a distance of perhaps 8 km. This is part of the most spectacular group of statues - there are 15 here with a great view of the ocean behind. It seemed that all of the statues that were close to the shore faced inland. We are very much looking forward to finding a quiet anchorage (Mangareva in the Gambier Islands of French Polynesia) and will be leaving on Saturday for this spot. Along the way we will be passing Pitcairn Island and will try to go ashore there. This is often very difficult as the anchorage there is even worse than the one here – we will try our best however and look forward to buying some of the famous stamps there. Pitcairn is about 1100 miles from here and Managareva another 300. Weather conditions should be much nicer and we will be going down wind for a change. SPOT watchers. We received message sent notifications all the way to Easter but don’t expect this to continue very far as we go west. Posted by Bruce at 1:04 p.m.
April 1, 2011 at 5:32 p.m.
Any word on the fate of "Bobby"
April 5, 2011 at 10:41 a.m.